Yesterday, I was going to spend this $20 to have my car washed. On the way to work after going home for lunch, I stopped by a huge yard sale to look for yarn. I really didn't think that I would find any. The yard sale was from 8 AM to 3 PM, it was 2:45 and the people were packing stuff up and leaving. While I was walking around, some one asked me what I was looking for. 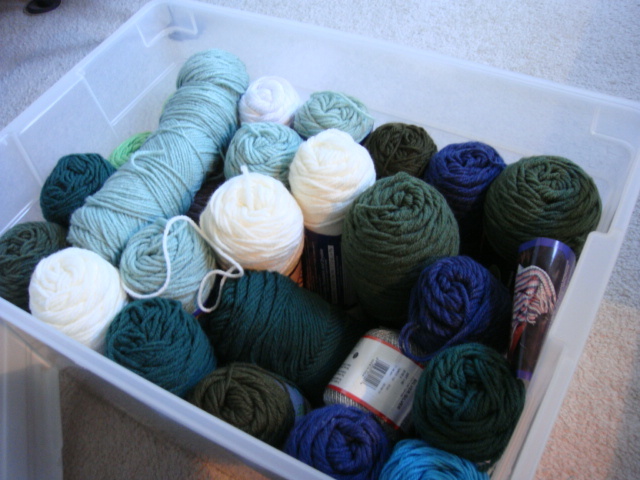 That's when I looked by the man's feet and saw this big plastic box with yarn. Yep, that's what I was looking for...cheap yarn. I ended up with 23 skeins of yarn. At the store, I would have paid 3 for $6 and 20 for $4. Ha, the car will have to wait.